NASA says it’s begun testing the stationary lander spacecraft it plans to send to Mars in 10 months to help scientists understand Earth’s red neighbor and hopefully learn more about rock-based planets. The space agency said on Wednesday this week that testing is underway on the Lockheed Martin-made lander it calls InSight—an abbreviation for Interior Exploration using Seismic Investigations, Geodesy and Heat Transport. Currently, NASA intends on launching InSight from Vandenberg Air Force Base in California in March 2016 and having the spacecraft land on the Red Planet around six months later. The more scientists learn about Mars, the better they can prepare to someday send an astronaut on the 140 million-mile journey. As it stands now, NASA hopes to accomplish as much sometime in the 2030s. Among the tools outfitted on the car-sized InSight are a probe that will be used to measure the planet’s seismic activity and heat flow, NASA said. Additionally, the scientists intend on deploying two small satellites along with the lander that will transmit data from InSight back to Earth. "Today, our robotic scientific explorers are paving the way, making great progress on the journey to Mars," Jim Green, the director of NASA's Planetary Science Division, said in a statement. "Together, humans and robotics will pioneer Mars and the solar system." "The assembly of InSight went very well and now it's time to see how it performs," added Stu Spath, the InSight program manager for Lockheed. "The environmental testing regimen is designed to wring out any issues with the spacecraft so we can resolve them while it's here on Earth. This phase takes nearly as long as assembly, but we want to make sure we deliver a vehicle to NASA that will perform as expected in extreme environments." 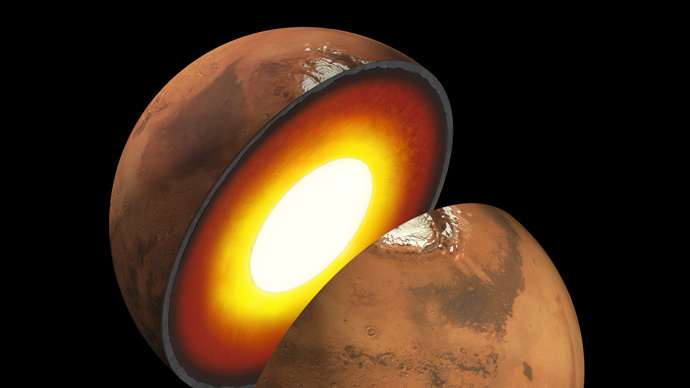 Last month, a report revealed that Curiosity, a roving spacecraft that’s been conducting tests on Mars since 2012, determined that the presence of liquid brine beneath the planet’s surface contradicted previous theories that the Martian atmosphere is too arid and cold to host water.